Arizona is a beautiful place in the middle of the southwestern desert. While the desert and succulents can be pretty, we welcome any greenery to the area! Whether it is to play a game of golf, toss a ball around with your kids, or just appreciate the way the greenery looks in your yard, we all have a reason to enjoy a healthy lawn year-round. Keeping it green and healthy all year long takes a bit of effort, but the end result is its own reward. Continue reading below to learn how to properly reseed your lawn for winter and achieve the best possible results! Moon Valley Nurseries recommends using Perennial Ryegrass for over-seeding or reseeding your lawn in the winter. Ryegrass grows into a beautifully dark-green lawn. 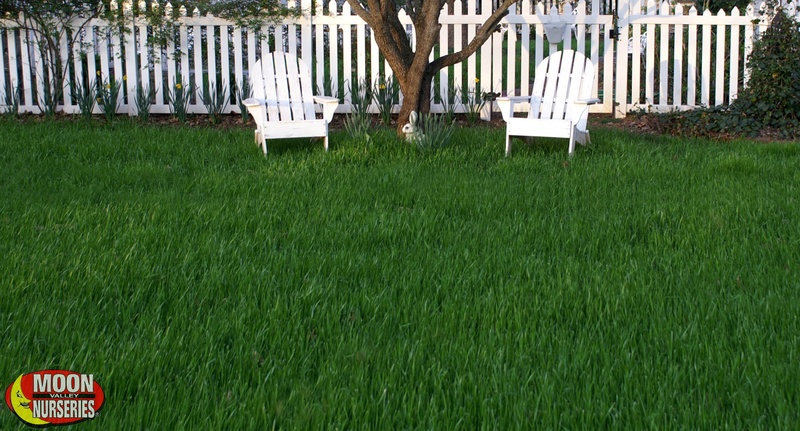 Many Arizonans even prefer the more attractive look of winter grass than their summer lawn! When is the best time to reseed for winter lawn? In our area, the cool fall nights allow for the perfect planting weather. In fact, once the temperatures in Arizona drop down anywhere from the low 70’s and into the 60’s, we can start the seeding! Reseeding once the nights cool down to the right temperature will give you peace of mind that the sun won’t burn the seedlings. However, don’t wait too long to start the reseeding process or the nights might get too cold to grow new seeds. Aim for early to mid-October! For your lawn to have the right amount of room to grow new seed, you will need to cut the summer grass as low as you can go. The removal of thatch and leaf buildup ensures that the seed gets down to the soil. Set your mower blades to a 1/4-inch to 1/2-inch height. You might have to mow an extra time or two to reduce the thatch as much as possible. This should leave you with a nice brown lawn ready for step 2. Once the grass is dethatched, you can start to spread the Ryegrass seed. Spread the seeds half in one direction and the other half in a direction that is perpendicular to the first direction. Spreading the seeds in that way will lessen seed overlap and catch any missed areas. It is important to spread the seeds as evenly as you can. Before you start watering, be sure to fertilize! Feel free to reach out and speak with your local Moon Valley experts. We will be happy to help you select the perfect fertilizer for you and your yard. A well-composted mulch (available at Moon Valley Nurseries) will help retain moisture and heat which will aid with germinating perennial Ryegrass. Once you have spread the seed, you will want to spread the mulch evenly over the entire lawn and do it to a 1/8-inch to 1/4-inch thickness. Maintaining a moist environment for your seeds is crucial for healthy growth. Water about four to five times a day but be sure not to leave any puddles or dry spots. Don’t worry, once the seed has germinated and grown to a height of 3/4-inch to 1-inch, you can reduce the watering to two to three times and day. After 10 to 14 days, you can reduce watering to once a day. Once your new lawn is established, it just needs to be watered every other day in the winter. More watering might be needed if the nights start warming up. After all that hard work, your new beautiful winter lawn is finally here, and it is time to mow again! The first mowing should happen on the 10th to 14th day after germination. You will want your first cut to be at the height of about 3/4-inch to 1-inch. To prevent pulling out your new seedlings, never remove more than 30 percent of the leaf at one time. If you like a higher lawn, wait a little longer for the first mow, around 14 to 21 days, after germination. Winter lawns require feeding just like that summer lawn does. We recommend using a fertilizer monthly to keep your lawn in the best condition. Be sure to ask any of our Moon Valley Nursery experts for the best fertilizer to feed your new beautiful winter lawn! 1 pound per 100 sq. ft at min.